EMC2 is the world’s leading developer and provider of information infrastructure technology and solutions that enable organizations of all sizes to transform the way they compete and create value from their information. Over the past several years EMC has grown significantly through acquisition. One purchase, Documentum, a highly successful content management system, was using a sophisticated marketing/sales system that surfaced as a powerful tool for generating important selling advantages by using current customers to act as references for potential new customers. EMC decided to leverage this tool across the entire EMC footprint. Media Net Link was hired to help with the development of this new Studio E.
Documentum developed Studio D, a fun savvy site that encouraged Documentum customers to join the community site for various benefits such as rewards, contact with senior executives, connections with peers and all sorts of features and benefits. In return, the customers would help Documentum as references for sales reps and their prospects. The system gathered specific information on each reference so when a reference was requested the Reference Manager could contact the appropriate customer for the specific business potential. The system was powerful but ultimately limited in many ways. EMC asked Media Net Link to help design a new far more powerful system that could handle a company the size of EMC world wide. MNL worked with the EMC team to collect specifications both from the previous web site as well as new requirements. Then we applied an approach that has worked very well on past large-scale projects. Instead of just collecting requirements in written format, we built click-through mockups in html format. The clients were able to view the new site in a web browser and click from screen to screen. On these mockups 90% of the links and buttons were either functional or imitated the live functionality. This approach allowed our clients to see “the real thing” and use it as they would in real life. Many workflow and UI improvements arose in this phase of the project. Since html updates are easy and fast to implement, this approach speeds up the project; fewer modifications are needed later in the project when the web site is connected with a database and changes can become more time consuming. 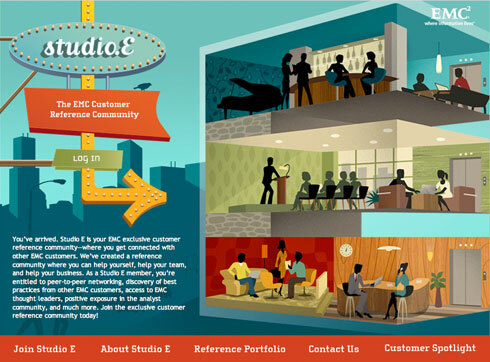 The Studio E web site provides EMC with many intricate workflow processes connecting multiple levels of membership as well as multiple levels of administrators. Extensive reporting gives EMC managers a broad view as well as detailed views into their reference membership. A built-in email system tracks communications between Reference Managers and members. It also allows members to communicate with each other using a fully functional email system. Testing the Studio E system posed MNL with special challenges. Membership in Studio E requires a unique email address and public addresses like Yahoo or MSN are not allowed. This required we set up special processes that were in place only for testing. Upon go-live these processes had to be removed and we had only a short time to re-test the system. In terms of technology, Media Net Link decided to push the envelope to better serve our clients. Below is a more detailed description of the approach we used and the technology we applied. Some traditional PHP programming was used to create a mail system that allows users to send and receive emails without having to show their email address. A hash system allows users to use either a web based system or programs like Outlook to send mail that goes to the server, and then the “To” and “From” address are translated from a hash code to the senders/receivers email addresses. This makes users’ personal email address more secure from people who would use such information for SPAM purposes. The database was designed with the Postgres database. The design allowed for maximum scalability so that EMC can keep a history of user data. In fact a history section was designed which allows for a quick history of user interactions with many different tables. This was accomplished by storing not only the key in the database but the table and key field as well. Media Net Link built the whole Studio E custom from the ground up in five months. Because we are the host and primary support for the system we built the Studio E for easy access, quick maintenance and down stream enhancements. Built as a module, EMC has plans to expand the platform across other marketing and selling disciplines. EMC gets a tool that can not only provide invaluable information on their customers and put meaningful references at the critical point of closing a sale but also creates a community space where customers can come and interact with EMC and others especially on complicated technical issues.